Thursday, January 31st, 2019 - A New Year means a new crop of players from Arizona will go pro and the first signing of 2019 didn't have to do to far. 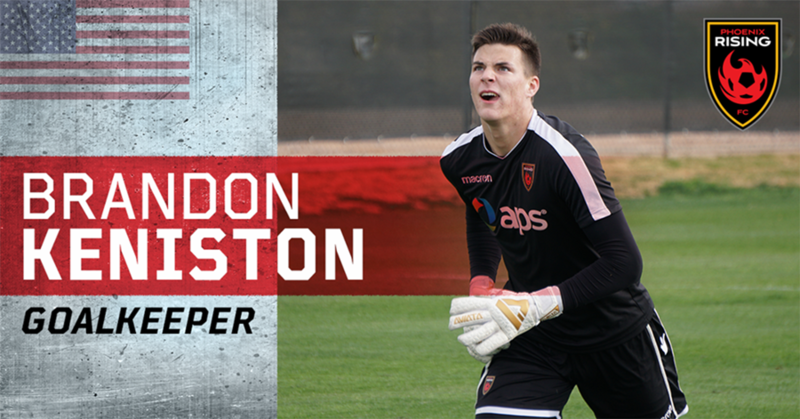 Phoenix Rising FC announced it has signed goalkeeper Brandon Keniston for the 2019 season. Keniston is the second local player to sign with Phoenix Rising FC, joining Evan Waldrep who signed last year. Keniston will be registering as a USL Academy Player, which means he can play competitive matches for Phoenix Rising FC without jeopardizing his amateur status. Keniston played locally for Phoenix Rising FC (started with them when they were Scottsdale Blackhawks), Arizona Soccer Association's ODP program, and he played high school soccer at Chaparral High School. He recently has been competing at the ECNL level and this past year he was in Almunecar, Spain, playing for FC Malaga City Academy where he went head-to-head against 18U and 19U teams from Real Madrid, Athletico Madrid, Malaga CF, and Sevilla.